I have a secret: I can’t watch enough Christmas movies during the holiday season! I absolutely LOVE them! From the minute Thanksgiving is over until the end of the year, I’m always watching. Some of my all-time favorites are those Christmas movies that are based on books. I love to see how directors and actors bring my favorite tales to life. Take a look at a few of my picks for the best Christmas movies based on books, then tell me your favorites! I could always add more holiday flicks to my watch-list! The Polar Express was released in 2004 and is based off the 1985 book by Chris Van Allsburg. The movie stars Tom Hanks in 6 different roles within the movie: narrator, hero boy, hero boy’s father, hobo, conductor and Santa Claus. It also stars Daryl Sabara, Jimmy Bennett, Nona Gaye and Eddie Deezen. The movie tells the story of a boy who starts to have doubts that Santa Claus is real. One Christmas Eve, he is awoken by a train outside his window. He asks the conductor where the train is headed and he jumps on board when the conductor states they are headed to the North Pole. He finds other boys and girls on the train, as their adventure begins. One of my favorites! It literally gives me goosebumps! A Christmas Carol was released in 2009 (the latest adaptation) and is based off the 1843 novel by Charles Dickens. There have been several adaptations on film, television, theatre and radio. The movie stars Jim Carrey in several roles including Ebenezer Scrooge and the three ghosts that haunt him. The movie also stars Gary Oldman, Colin Firth, Bob Hoskins, Robin Wright Penn and Cary Elwes. When Ebenezer Scrooge is visited by three ghosts and he must take heed of what occurs. The ghosts of Christmas past, present and future show Scrooge how he went from a happy young man to a money hungry miser. What does the future await for Scrooge? How the Grinch Stole Christmas was released in 2000 and is based off the 1957 novel by Dr. Seuss. This Christmas movie has an all-star cast that includes Jim Carey, Jeffrey Tambor, Christine Baranski, Molly Shannon and Taylor Momsen. The Grinch doesn’t like the town of Whoville, or its friendly residents, the Whos and he hates Christmas. He is determined to steal Christmas away from the town and its residents. However, his plan doesn’t include meeting Cindy Lou, a young girl who tries to be the Grinch’s friend. A Christmas Story is a TV movie released in 1983 and is based off the book In God We Trust: All Others Pay Cash by Jean Shepherd. The movie stars Peter Billingsley, Melinda Dillon, Darren McGavin and Ian Petrella. Ralphie Parker only wants one thing this Christmas: a Red Ryder Carbine Action 200-shot Air Rifle. However, his wish seems hopeless when every adult he comes upon, including his mother and his teacher, tell him the rifle is a bad idea because it will shoot his eye out. As Christmas draws closer, Ralphie visits the mall Santa to ask him for his dream present. What happens when Christmas morning comes along? Also, fun fact: although it’s not exactly even remotely a good family movie, the Bruce Willis film Die Hard was based on a novel called “Nothing Lasts Forever.” It’s considered a Christmas movie because it takes place on the holiday. So while I wouldn’t include it on this list of good family movies for Christmas, I just thought I’d share that little tidbit! 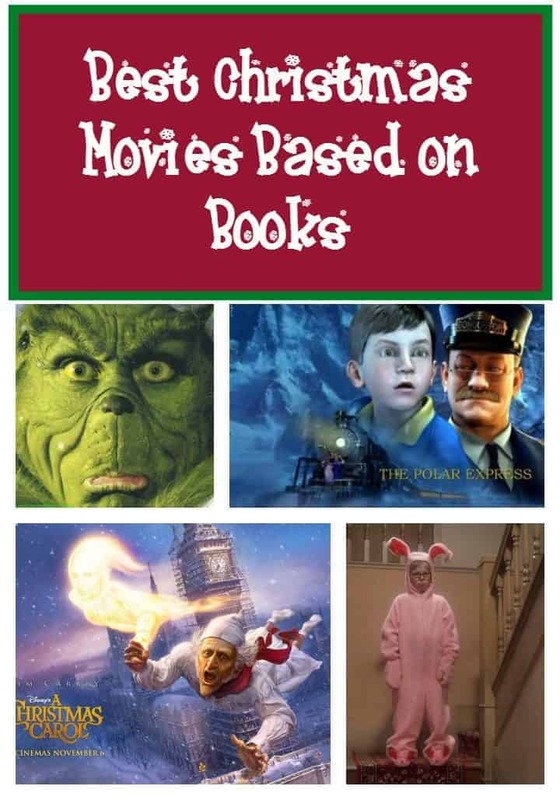 Which of these Christmas movies based on books did you watch? These are some classic Christmas movies. Reading this post really puts me into the holiday spirit. Oh I love all of these movies but A Christmas Story is sooo funny, we watch it all the time. I also love Miracle on 34th Street, such a classic. I am such a fan of all of these movies! One of my favourite things to do once the christmas season begins is to sit on my couch on a snowy night and watch A Christmas Story with a warm cup of hot chocolate. You chose 4 of my favorite books and movies. I think Polar Express will always be at the top! I love that Polar Express movie. I didn’t know it was based on a book. I would love to watch the Christmas Carol, it looks that you will have a good lesson, and you will feel the Christmas is near to come. The Grinch is one of my kiddos faves. They can’t wait to start watching. I would love to see a Christmas story, I haven’t ever! What a great list! There are so many classic holiday movies made from books. These are some wonderful ones. We read most of these with the kids when they were younger. I still have to see some of the films! Such great movies! I really love the Polar Express. Is it sad I’ve never read any of these books? I thought they were only movies. I wonder how different the books are versus the movie. I remember seeing The Polar Express in theaters! It’s such a cute movie, definitely a classic in our house. These are all great movies. How the Grinch Stole Christmas is one of my favorites. A Christmas Story is my all time favorite movie! It’s so darn funny. I just love A Christmas Story. It reminds me of being a kid and now my kids like it too!